Last year on July 22nd, I posted my first post as an intro to the blog. Two days later I posted Dear Dreamer, and ninety plus blog posts later, here we are. That being said, this is truly only the beginning. Thank you for being so supportive, and loyal, and know that I am so happy to call you all family. With everything going on (the book and the UNPOPULAR Movement) I have had to apologize to you all way too many times! That is only because I started this whole journey with you all and I hold that very close to my heart. This past year hasn’t been the easiest, but in no way has it been the hardest. There were times when my faith meter needed a boost and when my confusion levels were high, but God… here are a few things that helped me get through and I hope this helps you! 1. Use every situation as a learning experience… I ask my nephew TJ every time I see him, what did you learn today? At first he thought I only meant in school, so when summer rolled around he hesitated with his answers. I told him that every day he should learn something new, and if I hold him to that standard, then I too should be on this quest for life long knowledge. Things don’t just happen to us by happenstance, so when you go through a situation use it as a building tool, and grow! 2. Your past doesn’t have to be your future… I struggled with returning home… it was difficult for me to be in the physical location of my “old life” and be my “new self.” Once I realized how to cope with these conflicting emotions I didn’t feel as if my life was split in two. I needed those past experiences and past relationships, because ultimately they helped shape me into who I am now. That being said, I know better now, I know my limits and I know who I am, and that’s not who I used to be. I’m moving forward. 3. Even when it gets hard, stay faithful… there will be times when you want to stop. There will be times when you feel like it’s too much. Don’t stop moving. Don’t stop believing. These moments are only increasing your endurance. IF YOU KEEP GOING! There were times when I forgot why I was doing this. Why I decided to share writing in the first place, but when you realize that your purpose isn’t just for you, obedience is a lot easier to digest. 4. Your gifts will make room for you… if you walk in that obedience. They will allow you to be where you need to be when you need to be there. Your gifts will place you in front of people who are great. 5. Wise council… is the difference between disaster and disasters averted. “Fools think their own way is right, but the wise listen to others.” Surround yourself with individuals who won’t tell you what you want to hear all the time. You don’t need a yes man or yes woman, you need someone who’s going to be honest with you about where you are and what you need to work on, while encouraging you to get better. 6. Love is… necessary. You can do far more with love than you can ever do with anything else. When you learn to love your brothers and sisters as Christ has loved us, it changes your perspective, it changes your thought process, and ultimately it change the way you deal with situations. 7. Speak life… because why would you want to speak anything else? As a child we were taught that sticks and stones may break my bones but words will never hurt me. That’s not true, words can cause far more damage than a lot of other things. Words have the power to uplift, to empower, to build up but words also have the power to destroy, to tear down, and put people in a state where they lack self-confidence. Be positive. Speak positive. P.S. 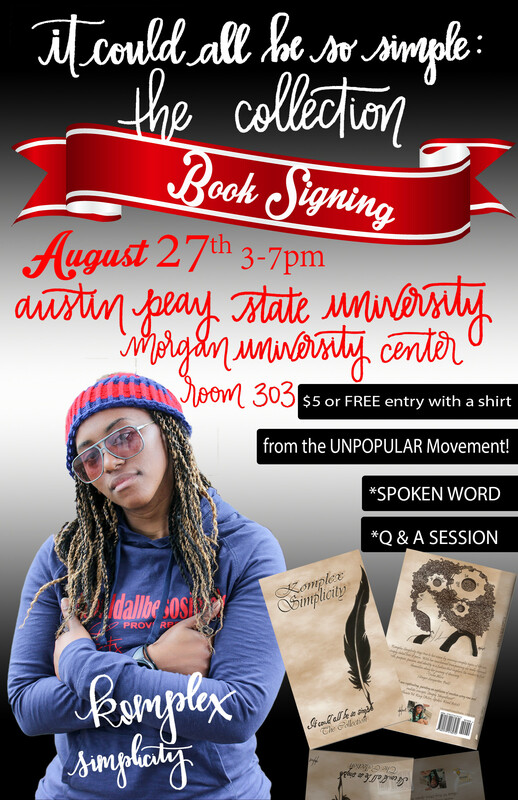 if you’re in the Clarksville area August 27th, I’ll be having a book signing at Austin Peay University. I hope to see you there! Thank you so much for your words of encouragement…That’s exactly what I needed to hear. I hope you have a blessed day.